SHAWNEE, Kan. — A law that has been on the books in Johnson County since the 1980s requires businesses that want to sell alcohol to make a minimum of 30 percent of their revenue from food sales. 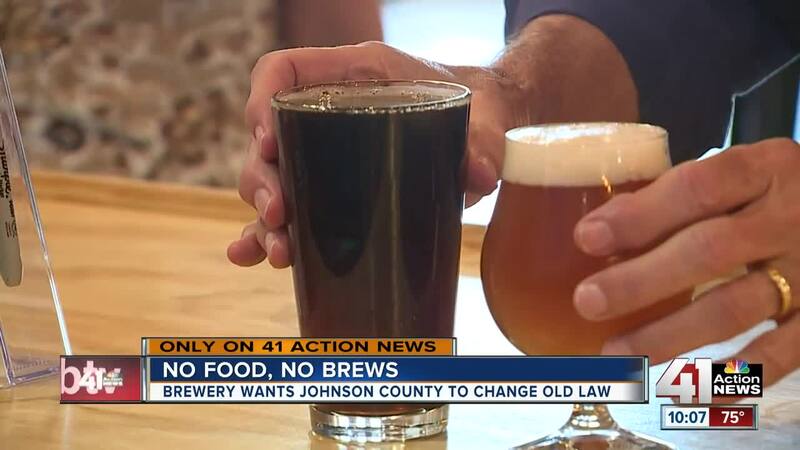 Now, local breweries are banding together to get the rule changed. "There's two ways to put it on the ballot. One is by a petition, or a majority of the county commission can authorize putting it on the ballot," said Ed Eilert, chairman of the Johnson County Commission. Transport Brewery opened in Shawnee in February. Co-owner Jason Leib said he knew about the 30 percent rule but didn't realize how difficult it would be until the business opened. "People don't go to microbrewery taprooms for the food," Leib said. The Johnson County Commission has contacted the Kansas secretary of state to determine when the issue could be placed on a ballot.